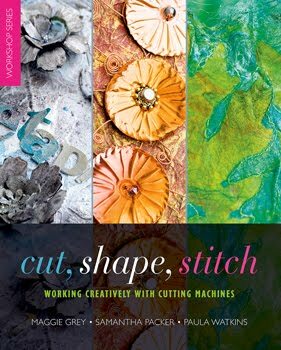 We all know that there are times when the gentle task of stitching or doodling or playing with colours has kept us calm and soothed our minds when times are sad or stressful. And we know that having friends who are behind us with kind thoughts and quiet support is so reassuring when times are tough. Now there is another way to be a quiet friend through Art and it is a way to help save lives and let somebody know that we are thinking of them. Maggie Grey and Workshop on the Web are holding a Sketch-a-Thon in aid of the Teenage Cancer Trust. They would like to help this fantastic charity by asking us, everybody who would like to join in, to make a sketch book and send it to them to be sold to raise funds. Even if you are new to working in sketchbooks or don't have time to completely fill one I hope you will think about having a go. You could just make a beautiful cover on your book or work on one with a friend. It can be a bought sketchbook or one that you have made yourself. You could make one from recycled cardboard and junk mail or maybe old envelopes. I am going to make two. They are going to be on the theme of fish! 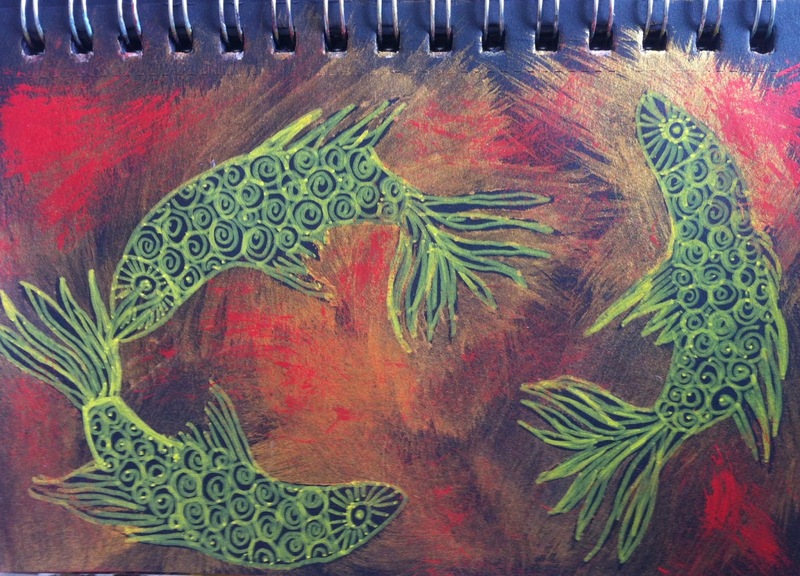 I have been having fun thinking about fish shapes, colours and textures. All things fishy! I have just sent off my first book. It is a bought sketchbook with black card pages. It is not completely filled because I'd love to inspire the person who buys it to finish it in their own style. It will be a collaboration! Would you like a sneaky peek at some of the pages? The background is painted and stencilled card. 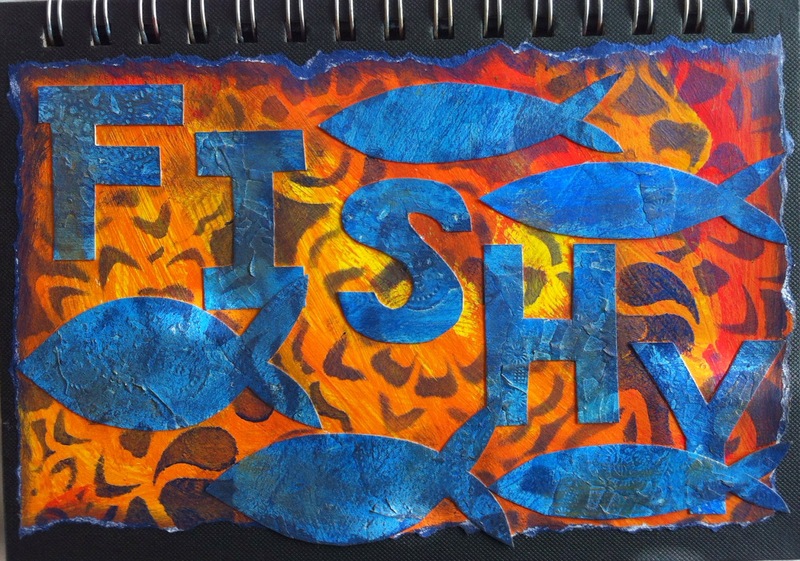 The blue fish and lettering are card which has been collaged and painted with shades of blue to show up the texture. 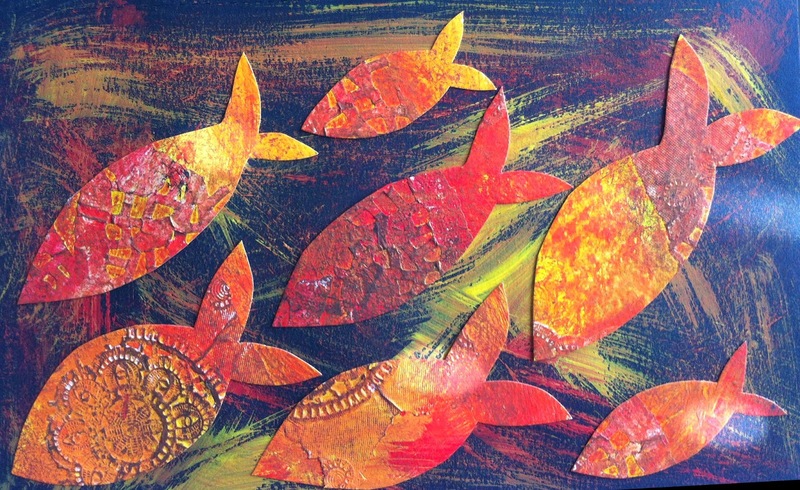 This next page is collaged with fishy patterned napkins and stencilled with acrylic paint. This one has fish cut out from the same card as the background on the cover but has had decorative papers added. I cleaned my brush on the black page; dry brushing for a background. These next two pages go together because the top one has been cut to reveal the fish and colour below. This took a while to do but I was really pleased with it. 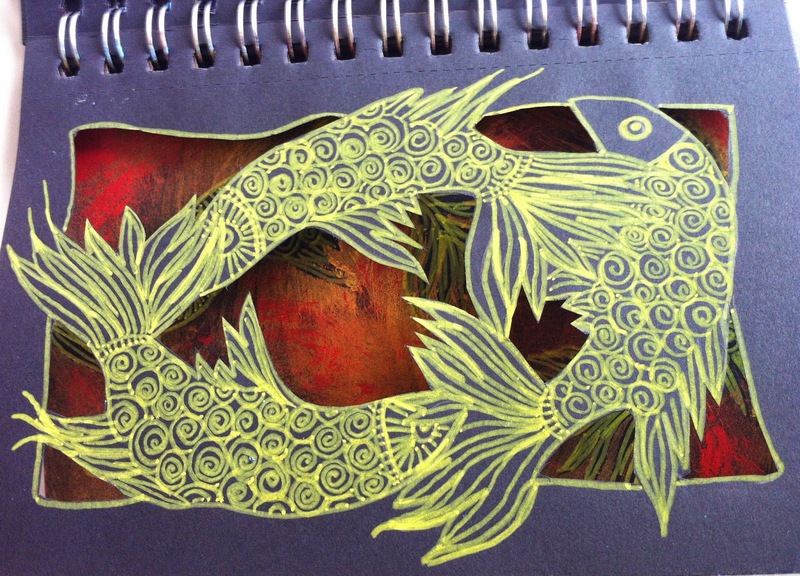 Below is a fish shape made with an original hand cut stencil/mask. 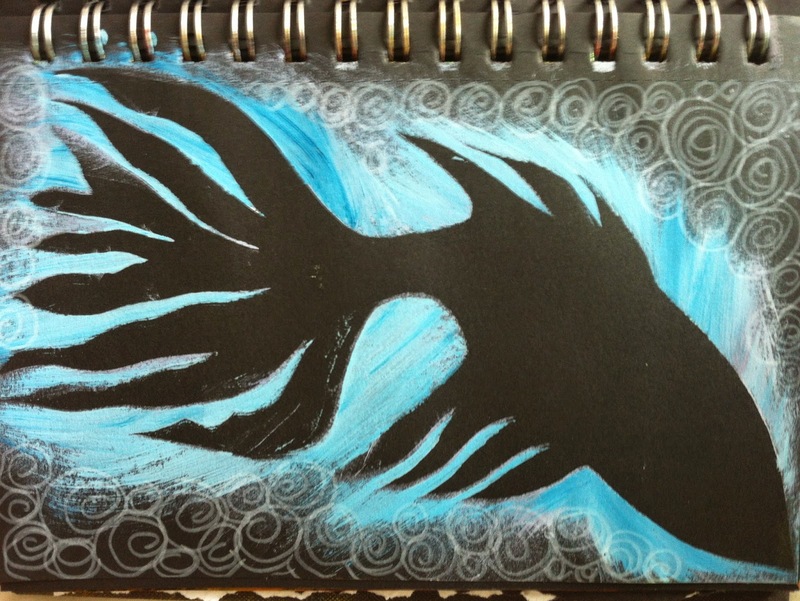 I just liked the dramatic black shape against the swirls and blue. 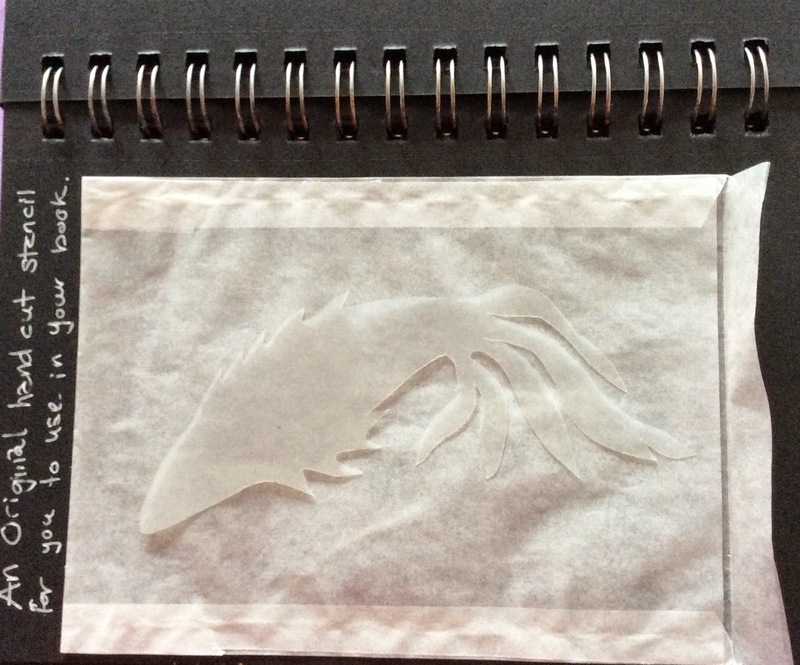 The last sneaky peek is a glassine envelope which s attached to one of the pages. It contains an original hand cut mask of a fish. I am hoping the new owner of the book will use it to finish the book in their own way if they would like to. 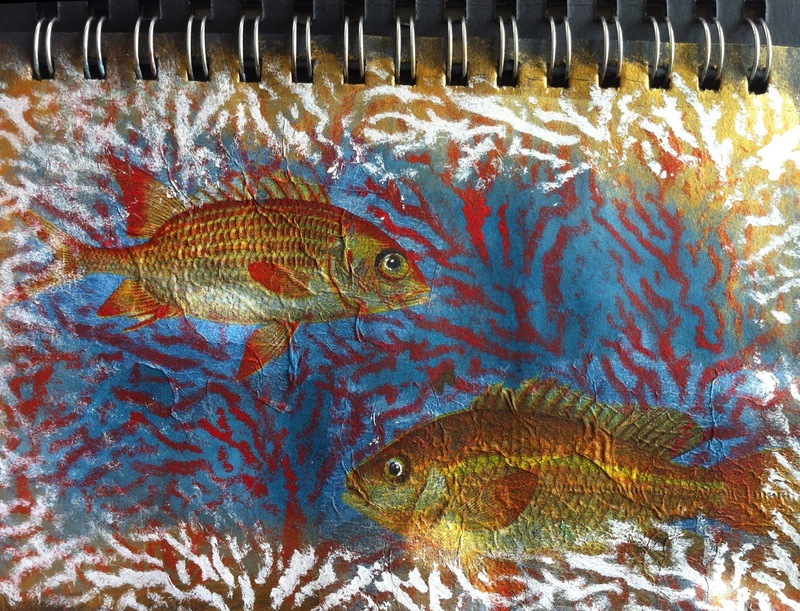 Just love these fishy pages. Inspiring!! Thanks so much Hilary. I love your little Vilene and lining paper book.